^^I hold a two minute plank everyday!! Either in the morning after my workout or before I go to bed!! It made all the difference in flattening my stomach after having two babies!! I had to slowly build up to holding two minutes. I’ve had A TON of reader emails and DM’s asking me about my morning routine so I thought I would steer away from the usually outfit post and share what most moorings look like for me. I usually wake up between 5:30 and 7 to get my workout done for the day. Although I should start with- I have totally fallen out of my early morning habit lately. It’s been so crazy gearing up for the launch of my spring collection and I’ve had SO many late nights working that I’m totally out of my routine BUT that’s ok!! I haven’t been perfect lately but that doesn’t diminish all my hard work and my alarm is set for 7am tomorrow and I’m going to do a quick workout at home before I have to take Isla to pre-school and then run to a shoot and meetings. I’ve learning balance in all things and sometimes sleep is more important than a workout. Ok- back to my morning routine that I’ve been consistently following since May ’17. Set my alarm for around 6 (there’s only one day a week I wake up at 5:30 am to go to my favorite cardio class). I try to keep my routine consistent and I go with girlfriends, we hold each other accountable and it’s so nice to have my workout done before my babies wake up! Before I workout I eat a treetop apple sauce pouch. It’s light but has a little bit of sugar in it so it gives me a boost for my workout. It’s convenient and easy to grab and go. If I eat more than that before I workout I get sick! For my workout I usually do it at my sister’s house in her basement on M, W, F. I’m currently doing BBG Stronger program on the Sweat app BUT before I started this program I did three rounds of the classic BBG on the Sweat app. I would recommend doing that program first. I do BBG three times a week and then add in cardio classes or a run in on Tuesday, Thursday and Saturday! Also I hold a two minute plank everyday!! Either in the morning or before I go to bed!! It made all the difference in flattening my stomach after having two babies!! After I work out I drink a protein shake. I’m super picky about what kind of protein I drink but currently I’m using the Designer Whey Advanced chocolate protein and I’ve also been using a protein that actually hasn’t been released yet but it’s specifically designed for women! I’ll share more on that later, I can’t talk about it much until it’s released. I switch off between these protein powders depending on the day so they both last longer. I usually only mix my protein powders (in my mixer cup) with just water because it’s quick and easy and the lowest in calorie count. I don’t like to drink my calories, I would rather eat them. My sister’s think I’m crazy that I only add water but I honestly don’t mind it at all! 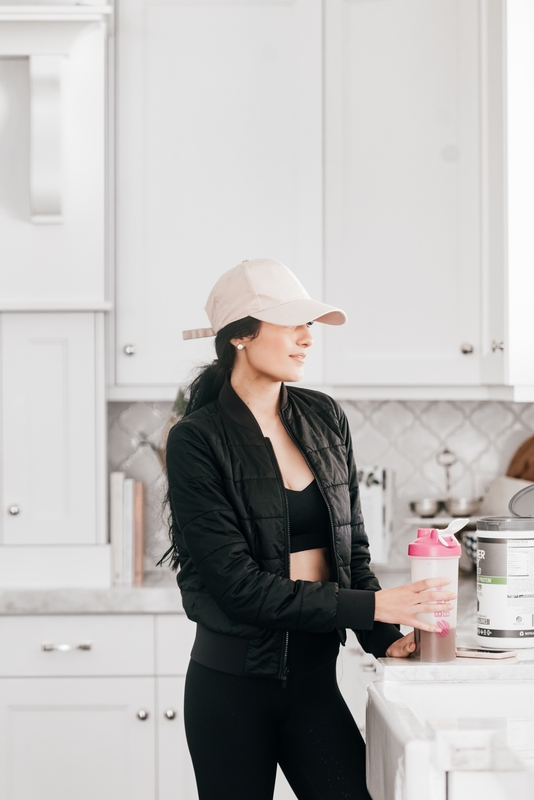 Below is a really good protein shake recipe I like to make when I’m not in a hurry and don’t mind making a mess in my kitchen. *Throw in blender and mix well. 5. While I drink my protein shake I usually catch up on emails and look at my to-do list for the day. 6. My babies usually start waking up shortly after so I run up and grab them from their beds, change their diapers and then we make breakfast. Their favorite breakfast is Kodiak Cakes and eggs. If you haven’t tried these yet you need to! There’s 14G of protein in a serving, they’re whole grain and all around healthier for you than regular pancakes. It’s a Utah based company and it’s all the rage here. No one eats normal pancakes- it’s only kodiak cakes!! I also like to make some scrambled eggs with the pancakes and it’s super good to add them on top of a kodiak cake with a TBS of pure maple syrup. It’s a little salty and sweet. I usually do this for breakfast on Saturday after a cardio class or run but my kiddies love to eat this combo almost every morning! During the week I typically have eggs for breakfast. Egg Breakfast 1: 1/2 cup cottage cheese, a handful of chopped veggies (I add onions) 2 eggs and 2 egg whites. Mix all to together in a bowl, then cook in frying pan. Egg Breakfast 2: Two eggs, two egg whites, 1 slice of Dave’s Killer bread (I use the 60 cal loaf) with a square of light laughing cow cheese spread on toasted bread and avocado on top. 7. After breakfast we get ready for the day, I run Isla to pre-school. I love getting a head start to my day before my babes wake up and I find that I actually have more energy throughout the day when I get up and hit the ground running! I use to sleep in around 9:30 or 10:00 when it was just me and Isla Rose (she was such good sleeper) but after I had Jackson, he always wakes up around 8:30 and I would dread getting out of bed when I would hear him cry in the mornings because I was SO exhausted. My body wasn’t up and moving yet, it takes me a while to wake up. Forcing myself to wake up early for a few weeks was hard at first but then it became second nature to me and I loved that I was already up and running to grab him from his bed at 8:30 instead of dragging my feet and wanting to go back to sleep! I will never understand how my body thrives on waking up early and I have more energy. You would think it would be the opposite! I hope this helped answer some of your questions about what my morning look like! I would love to hear your morning routines as well! It’s always so interesting and inspiring to hear how other women start their day! *also it’s 1am and I just typed this quickly. Please excuse any spelling or grammar errors. I don’t have a professional editor who checks these posts so please go easy on me. I know it’s probably not perfect but bare with me. Wasn’t intentional and if I had an hour to edit I could make it perfect but I need to go to bed! Love you all! Ive recently tried the kodiak cakes and im hooked. They are soooo good!! Thank you for sharing your morning routine! You have inspired me to starting waking up really early. I used to be able to get up at 5 am and get my workout done. But lately, I’ve fallen out of it. You look incredible! so jealous! My little one gets up at 6:45am every day, so if I want to work out before getting her to school/work – I have to be at the gym at 5am. I wish there was an extra 30 minutes that magically worked itself into the mornings LOL! I applaud your commitment to getting up early and working out – its one of my goals for 2018! Rock on! I have 3 kids and a busy full-time job anD i am up at 5:20 several days/week to get my worKout in too. Its harD but feels greAt. Youre doing a great job on all fronts and your kids are adorable and happy. Keep up the great work ???? I really love reading more about your daily life routines! So inspiring! I was Going to suggest this as well its helped my mombie braiN! It is a life saver! Brautiful post … simple and effective morning daily routine. ???? Love that you shared this! I love reading people’s morning routines. Lately I’ve been seeing Kodiak Cakes everywhere! I think I finally need to give them a shot now for real! Love this! You look great and I love the little glimpse into your day! Thank you so much for this. I have been so inspired by your transformation and I can see a huge difference in your COUNTENANCE, you just look so happy all the time! Good for you girl! Also, sorry you even have to put that disclaimer about grammatical errors… people can be so annoying. I look forward to your posts everyday, I have followed your blog for about 6 years. You are a dang rockstar. PS. Feel the same way about those kodiak cakes, hands down my favorite! Your body transformation is amazing! you did a great job, keep it going lady! Can you do a post on your babies’ schedule? I have a 22 month okd and would love to compare! What’s your take on protein shakes for PREGGOS? do you think the one you have listed above is high quality enough for PREGs?thanks! Love your moRning routine! Im not a morning person whatsoever either… but since i am tAking 8Am morning classes 4 times A week, i Have been forced to getup much earlier. Instead, i workout eithEr when i get back (so late morning) or night. I normally ROck climb and most recEntly started running… which is so so hard! :) ThaNks for sharing this post rach! Love your * at the bottom – good for you to ask for a break and recognize that it might not be perfect, but it answers the questions! Hope it was a reStful night of sleep! Absolutely love this post! I have discovered the same thing with getting up earlier I actually have more energy and feel better throughout the whole day then when I sleep in it’s so crazy but true! You are so beautiful and such an inspiration to me in every way. Your discipline as a entrepreneur a wife and a mother inspire me to do better. thanks for sharing with us! definetly going to try the 2 minute plank! I started doing BBG Because i heard about it from you. It really has made a difference in my mood even though i havent been able to stay consistent. Getting up early Has also made Such a difference in how i feel also. I love the plank tip! Im going to try it too… my stomach Is so sTretched from only one baby. You look so amazing! 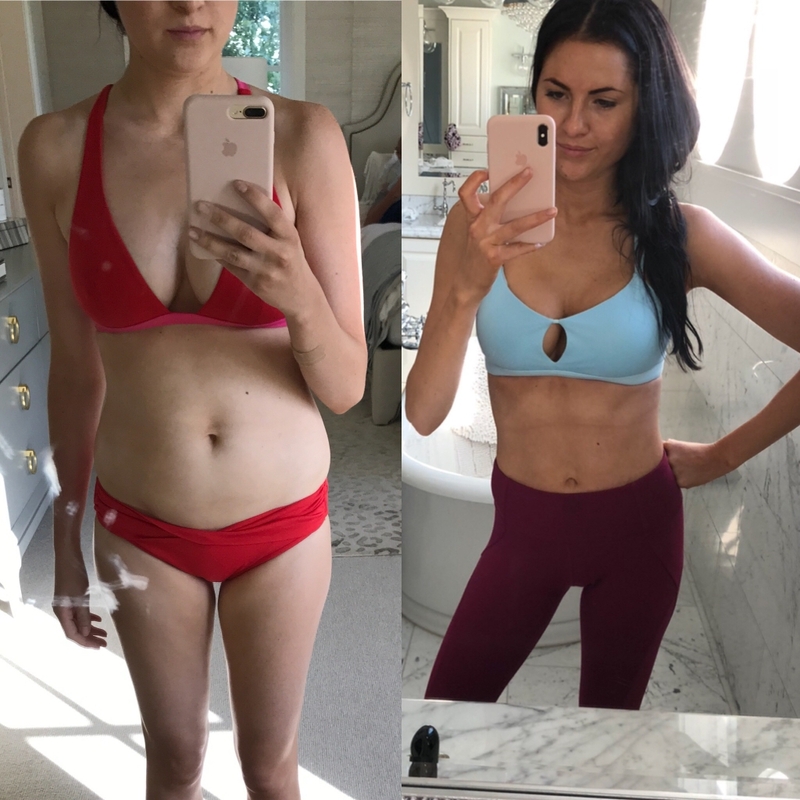 My twin sister and i started BBG after seeing your transformation. Were on week 8! my 7 month old wakes up around 5:45am! So its sooo hard to get up before him, eapecially wince he doesnt sleep through the nighy yet :( i would love to get my workouts out of the way in the am, but noRmally thaT doesnt happen. How did you get yours kids to sleep so late?? Thanks for sharing anD Thanks for the recipEs! I’ve followed your blog for years but have never commented on anything but i have to say Thank you for sharing this journey! I’m a new mom (my baby turns 1 next month!) and I have been so down on myself and my body for the past year and a half. your fitness journey is very inspiring. Thank you for inspiring and motivating me to become a healthy mama and wife! Thank you again for sharing this. You glow with confidence! Thanks so mUch for posting this routine! We love heAring from moms about how they make the schedule work. We drink our protein shakes wIth water only as well- glad we’re not the only ones! We can’t take one more mess! By the way, we are blogging about yoUr collection tomorrow- with photos- & can’t waIt to give our review! Love this post! Also wondering how you get your kids to sleep in! Yes i second that question! How many hours of sleep do you get a night usually? thanks for sharing! can you tell us what specifically you’re picky about regarding the protein shake? is it about the protein itself or calories? 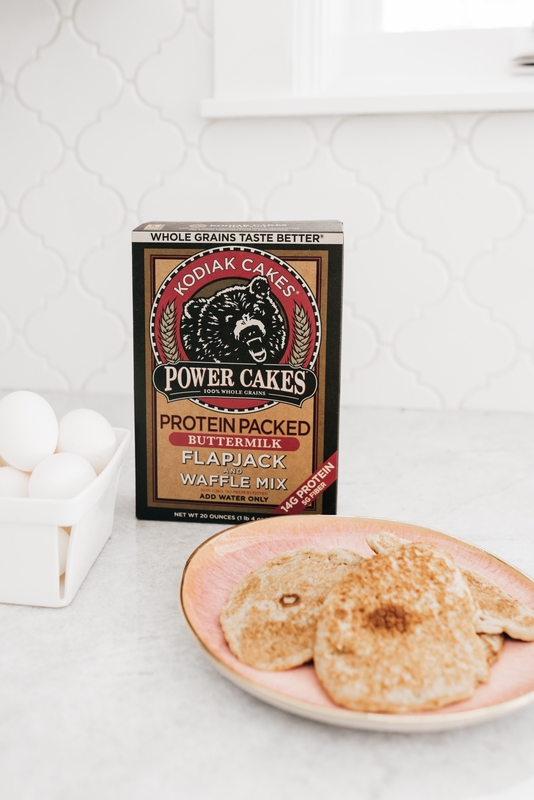 How do you make the kodiak cakes? With water or milk? Love this! Thank you so much for this post :) I also owe you a huge THANK YOU because of you mentioning the tree top applesauce packets! I also workout early in the morning and have to eat something small, the applesauce has made all the difference! also these are great breakfast recipes! Have a great day! You look amazing and your progress is so inspiring. Thanks for sharing! 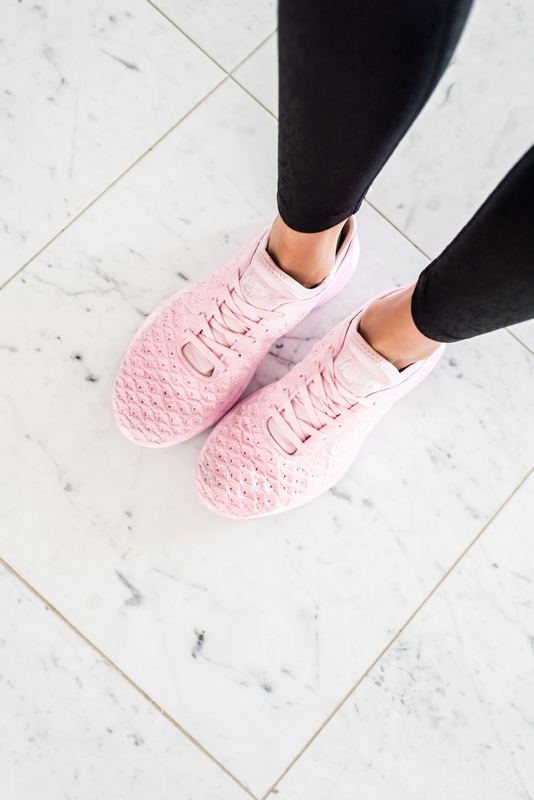 Question for you- are these APL shoes good shoes for running? I remember you saying on a previous post that you liked completing BBG in Nike’s but not to run in them. Wondering if this brand is better for running or if i would be better off in the other brand you recommended in an earlier post, Saucony. I am starting to add the HITT in and doing sprints and plan on trying to work on running longer distances as I get stronger and the only gym shoe brand I own right now is Nikes. thanks!! Would love a post on a full day of eating, how many calories you eat etc.! wow, sleeping until 8:30 is a luxury! I can’t sleep in that late if I tried after years of working and being a mom with kids who wake up at 6:30. lol. That’s not early. My babes go down around 7:30 or 8 depending on the night! I got lucky they have always been pretty good sleepers! Id love to know what the rest Of your diet looks like! Hi Rachel! I’m a long-time follower of your blog and absolutely love it! I was surprised to see you don’t have an eDitor for your posts. Is that something you have a Need for? I’m an editorial manager at american greetings (the card company!) and do freelance writing and editing on tHe side, would love to help you if you decide you need an eDitorial eye! Thanks for sharing yOur morning routine! Im on week 8 of BBG StRonger. Ive alwaYs been a gym Member but fell into a rut and felt Bored with my tYPical routine. Your bbg posts inspired me! I love the sweat app and it has brought life back to my workouts. Thank you for sharing… THe link isn’t working for the sweat app. can you relink it? I love that you shared your real morning routine. You’re such an inspiration! I t I think it’s so important to share with your readers. I Love all of your outfits and your styling but this is part of being a full complete woman, mother, wife, professional etc. y you are very inspiring and you have given me the kick that I need to start setting my alarm. You got me hooked on kodiak cakes too! My kids love them and i feel better about them eating pancakes so often because of the protein. I also started doing bbg 10 weeks ago and love it!! I have 3 kids, have always been a runner and incorporated weights into my workout but i feel like bbg has helped me so much. Thanks For sharing! I love kodiak cakes. I make pancakes and waffles on the regular. I usE Walden farms chocolate or strawberry syrup. Its much better than all the sugAry stUff. You look great! WHY IS EVERYTHING IN CAPTIAL LETTERS??? I THOUGHT THERES A PROBLEM WITH MY MAC. ANYHOW RACHEL YOU SHOULD BE PROUD OF YOURSELF!!! YOU HAVE SO MUCH DETERMINATION AND YOU EXERCISE SELF-CONTROL TO KEEP EVERYTHING RUNNING!! I FEEL LIKE I AM A SUPER LAZY MOM ON THE OTHER SIDE OF THE PLANET!!!! WELL DONE RACHEL!!! Thank you so much for sharing this! One question: when do you shower and get ready for your day? ThaT seems to be The HARDEST Part for me. I can fiT in the workout and breakfast before running kids but never seem to fit in getting ready! Help! Love this post! Thank you for sharing! I am so motivated by your transformation, and just bought the sweat APp! Question: if you get up at 7, what time do you typically go to bed? love these kinds of posts!!! You hAve just inspired me to go do my workout for today and keep on with my fiTness program!! I was inspired by your fitness journeY originally to start the bbG program and it works so well but of late i’ve strUggled so much to keep going. Thanks so much!! You do an amazing job, alWays inspiring! eNJOYED THIS POSt (CapS STUck, sorry). your story inspired me and my sister to start BBG, we are on week #6. Love your sports bra, can you advise on sizing for this line. have never tried it. would like to order the bra. thanks! Thanks for sharing! Can you clarify your morning breakfast(s)? Do you do the applesauce + protein shake + eggs recipe everyday? Sorry its in all-caps. Can’t fix it. Not Yelling. Promise! Thanks for sharing! Ever since you started sharing about your bbg progress, I was intrigued! I’m now at week 7 and feeling amazing! I haven’t been happy with my physical appearance since after my wedding. i get in these weird funks every now and then. i’m really thinking about starting bbg but am a little hesitant because i’m not a “good” workout person. your posts though are so encouraging that i want to give it a try! YOU’RE IN GREAT SHAPE, I USED TO BE A BALLET DANCER TOO, SO ALWAYS CRAVE MOVING. thanks for sharing! I love seeing typos on your site, it’s so real and raw, like you. :) this was so insiring because I am usually so tired in the morning and am going to try getting up really early to see if it works for me too. i know my productivity will skyrocket! SENDING LOVE FROM CHICAGO! HEY Girl! I know awhile back you used the wm nutrition pre workoUt supplements. Do yOu still Use those in your routine at all? Thank you so much for sharing your routine! It’s amazing that waking up early has helped you so much. Thank you for sharing your morning with us. i have a big problem with getting up early. i love to stay up late and then next day i’m so tired…. my kids wake up just befor 7 and i can’t leave my bad :( i really need to work on that!!! hugs from poland and thanks for the inspirations!!! You are such a doll for sharing this. It’s so nice to see women sharing how they make it all work rather than make it look like it just all coMes NatUrally. I also Find it makes a huge DIFFERENCE when i work out first thing in thE Morning. I always ASsumed i wouldn’t have the energy, but it ACTUALLY is sOmehow easier and i feel so much calmer The rest of the day. I’m on roud 2 of Bbg and combine it with 20-30 min cardio on My peloton. Like early morning workouts, i never thought i would like spin, but peloton is awesomE. When you say two eggs and two egg whites, do you mean Like over easy Eggs just to eat and then the egg whites with the veggies and cottage cheese or two eggs and two egg whites with everything? Thank you! And thank for BeiNg such an inspiration to be in so many aspects❤️ Your beautiful inside and Out! Rachel thaNkyou so much For your sHaring your experience, its really very inspiring! I just have a doubt about bbg peogram… did you do it on your own or eith a persoNal trainer’s help? I am elrried about not being able to do it on my own… thx!!!! !